Mercedes Benz India has rolled out the 2016 version of its best selling saloon, E-Class. Apart from some additional features, the company has not made any major changes to its overall look and technical aspects. Among its lineup, Mercedes-Benz E-Class E350 CDI Avantgrade is their top end variant. As far as its features are concerned, this latest trim gets a several new aspects like a multimedia system, the Garmin MAP PILOT navigation and a reverse camera. It is also blessed with a sophisticated COMAND Online system with 10 GB integrated hard drive. The manufacturer claims that this system helps you to find the nearest gas filling stations, ATMs, restaurants and hospitals. It has a satiny external appearance owing to its skilfully designed LED lights and a set of stylish alloy wheels. It is equipped with a 3.0-litre diesel engine, which comes with a displacement capacity of 2987cc. It has the ability of churning out a maximum power of 261.5bhp in combination with a peak torque output of 620Nm. On the other hand, the auto maker has blessed this vehicle with sophisticated protective aspects including all the passive and active safety features, which safeguards all the occupants in case of any collision. This luxury saloon is available with an unmatched three year warranty period without any limitation to its mileage. This variant has all the signature exterior features, which emphasizes its elegance from all the facets. To start with its rear end, it is designed with a radiant taillight cluster that is powered by skilfully sculpted LED brake lights and turn indicators. The boot lid has a curvy design, which is further decorated with a lot of chrome accents including the iconic company's badge as well. The bumper has a sporty design, wherein its lower cladding is decorated with expressive strips. Coming to the side profile, it has a few expressive lines that gives the vehicle a sleek stance. Its neatly carved fenders are fitted with lightweight 17-inch, 5-twin spoke alloy wheels. These rims are further covered with high performance tubeless radial tyres of size 245/45 R17. However, its door handles and ORVM caps are garnished in body color, whereas chrome treatment is given to its window sills. Its front facade is certainly the attractive aspect, thanks to the signature radiator grille, which comes with a lot of chrome treatment. This grille is flanked by a sleek headlight cluster, which is equipped with full LED headlamps along with adaptive high beam assist. It also has elegant LED day time running lights. The bumper has an expressive design with three air intake sections. 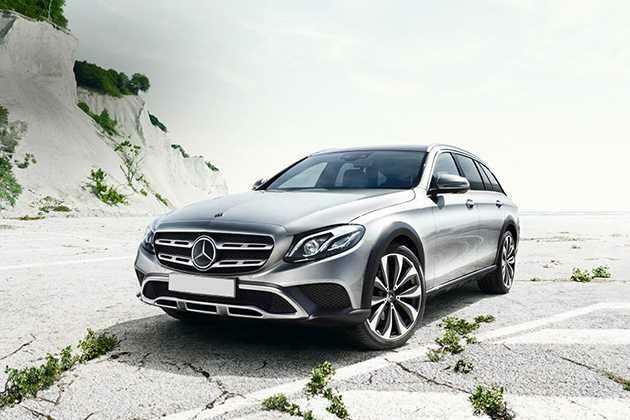 The overall look is complimented by the prominent Mercedes Benz 'Star' embedded on its grille. This variant a lavish cabin with top-notch interior design and a glimpse of sophistication down to the lowest detail. There is extensive use of chrome and wooden accents on the dashboard and door panels, which gives it a majestic stance. The cockpit is incorporated with a commanding driver's position with all the control functions placed well within the reach. The seats are ergonomically designed and are covered with ARTICO man made upholstery. Furthermore, they have side bolsters and head restraints, which provide excellent support to the body. This trim also gets a panoramic sunroof, which further provides a pleasant ambiance inside. Not only this, the company has also incorporated the cabin with several utility based features like storage spaces, map pockets, drink holders, sun visors with illuminated vanity mirror, a digital clock, all four power windows with express up/down function and many other such aspects. Under the bonnet, this vehicle is fitted with a powerful 3.0-litre diesel engine, which comes with a displacement capacity of 2143cc. This turbocharged diesel mill is integrated a common rail based direct injection fuel supply system. It is coupled with a 7G TRONIC Plus automatic transmission gear box, which enables the saloon to zoom towards a breathtaking top speed of 250 Kmph approximately and can break the speed mark of 100 Kmph in close to 6.6 seconds from a standstill. This engine has the capacity of churning out a maximum power of 261.5bhp at 3800rpm in combination with a hammering torque of 620Nm at just 1600 to 2400rpm. This saloon is bestowed with a proficient braking mechanism, which keeps the vehicle well balanced at all times. Its front and rear wheels are further equipped with a set of solid and ventilated disc brakes. These are further integrated with anti lock braking system along with electronic brake force distribution, which improves the braking mechanism. In addition to this, it is also equipped with an electronic stability program, which collaborates with ABS and ASR (anti slip regulation) to keep the vehicle stable. On the other hand, it’s both axles are assembled with a sophisticated direct control suspension system featuring selective damping system. It is incorporated with an advanced electric power assisted steering system, which offers excellent response and reduces the efforts required by the driver. This variant has an advanced 'THERMATIC' automatic climate control system with three zone control. Its temperature and air flow can be adjusted separately for each side. This variant is incorporated with a central locking with interior switch, adaptive cruise control, which also has speedotronic variable speed limiter, heated rear window with timer and Keyless entry. Its panoramic sliding sunroof creates an exceptionally light and friendly ambiance. It has an advanced infotainment system with touchpad, which is a mixture of entertainment, information and communication. It supports Garmin MAP PILOT navigation with 3D visualization, Internet capability, radio with twin tuner and it also allows networking with mobile devices via Bluetooth. This model series is also incorporated with an advanced instrument cluster featuring a color display. It provides informatics like outside temperature, trip computer, fuel consumption, fuel gauge, distance traveled, vehicle speed, gearshift position, tachometer, driver’s seat belt warning and a few other notification lamps for keeping the driver updated. It has seven airbags for minimizing the impact of collision along with extended adaptivity and automatic deactivation function for front passenger. It also has NECK-PRO head restraints for driver and front co-passenger, which helps in reducing the strain on the spine. In addition to these, this vehicle is equipped with an 'ASSYST ' service interval indicator, brake pad wear indicator, crash responsive pedal unit, electronic stability program, curve dynamic assist, fluid level indicator, ISOFIX child seat attachments and tyre pressure monitoring system. In addition to these, is being offered with an attention assist system that can detect symptoms of drowsiness on the basis of driver behavior and alert the driver to increasing fatigue and inattention. 1. Additional features like multimedia and navigation system is an advantage. 2. Lots of safety features is a plus point. 1. Ground clearance can be improved. 2. Initial cost of ownership and spares are very expensive.